Will The Shutdown Hurt Trump’s Re-election Chances? The partial government shutdown is beginning to drag on President Trump’s approval rating, which is at its lowest point in months. As of early Wednesday evening, his approval rating was 40.2 percent, according to our tracking of public polling, down from 42.2 percent on Dec. 21, the day before the shutdown began. It’s his lowest score since last September. And Trump’s disapproval rating was 54.8 percent, up from 52.7 percent before the shutdown. His net approval rating, -14.6 percent, was at its lowest point since February 2018. There shouldn’t be much doubt that the shutdown is behind the negative turn in Trump’s numbers. While there have been other newsworthy events over the past few weeks, such as turnover among Trump’s senior staffers and a wobbly stock market, the shift is well-timed to the start of the shutdown on Dec. 22. Trump’s approval ratings had been steady at about 42 percent for several months before the shutdown. 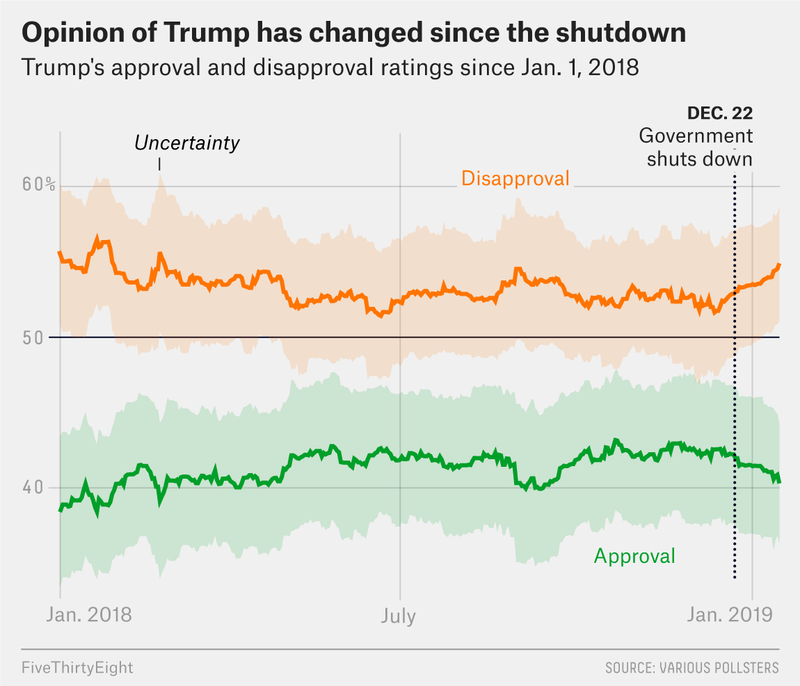 Since then, they’ve been declining at a fairly linear rate of about half a point for every week that the shutdown has been underway, while his disapproval rating has increased by half a point per week. Trump’s increasingly negative ratings match polling showing Americans growing concerned about the shutdown and disliking Trump’s handling of it. In a Marist College poll that was released this week, for example, 61 percent of respondents said the shutdown had given them a more negative view of Trump, while just 28 percent said they felt more positively toward him. But I wonder if that answer isn’t a little too glib. There are some reasons for Trump and Republicans to worry that the shutdown could have both short- and long-term downsides. A prolonged shutdown could also materially affect the economy, although there could be some catch-up growth later. A temporary decline in GDP or consumer confidence probably wouldn’t affect Trump’s re-election, although a long-term decline obviously would. CORRECTION (Jan. 25, 2019, 2:10 p.m.): An earlier version of the chart in this article incorrectly described the data it showed. President Trump’s approval and disapproval ratings began with Jan. 1, 2018, not the beginning of Trump’s presidency.